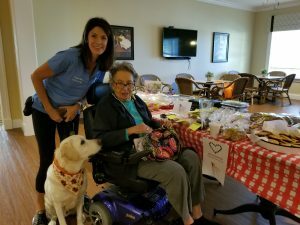 Residents at the Watermark at Trinity held a bake sale to support local nonprofit Southeastern Guide Dogs. The residents first learned of the organization when they they came to visit last summer. They were so moved by the mission that they decided to give back, raising more than $100 during the bake sale. Employees and residents baked up an array of goodies including all natural doggy treats prepared by the community’s Dining Service Team. Over $100.00 was raised through the community’s efforts!